Monday October 29, 2018: Michael warns Dawson, Jason and Sam get a lead, and Ryan heads to Ferncliff where Laura and Carly search for the mystery patient. At her place, Jason and Sam read through the letters between Scully and Jeanette. Some of them are from Jeanette to Scully, and Sam wonders how she was able to get them back from Scully. Most of the letters have nothing useful in them, but Jason finally finds a letter from Jeanetta asking Scully to get rid of Vincent so they could be together. In his room at the Metro Court, Finn and Anna discuss how to locate Obrecht. Sonny meets Michael at The Floating Rib. Michael is holding it together and keeping busy. He asks his dad if there is anything that he needs to know about what happened at Charlie’s. Sonny admits the DA is out for his head and won’t stop until she gets it. He warns Michael the DA may come knocking on his door. Sonny gets a text from Jason and has to leave, and Margaux swoops in to grill Michael. Michael has nothing to say to her. She reveals Sonny killed her father, just like he killed Michael’s. At a nearby table, Jordan and Curtis work on the seating chart for the wedding and discuss Aunt Stella skipping it. Curtis asks about Jordan’s search for Stella’s great love. Jordan found out he’s been happily married for thirty years. At GH, Ryan is about to head to Ferncliff to deal with Laura and Carly when Stella stops him. She’s furious he hasn’t written a referral letter for a patient who needs long-term care, and demands he write it immediately. At Ferncliff, Carly is eager to see the patient next to her cell, and looks through the door window of the room only to find it empty. Laura looks in and neither of them see Kevin, who is passed out at the foot of the door. 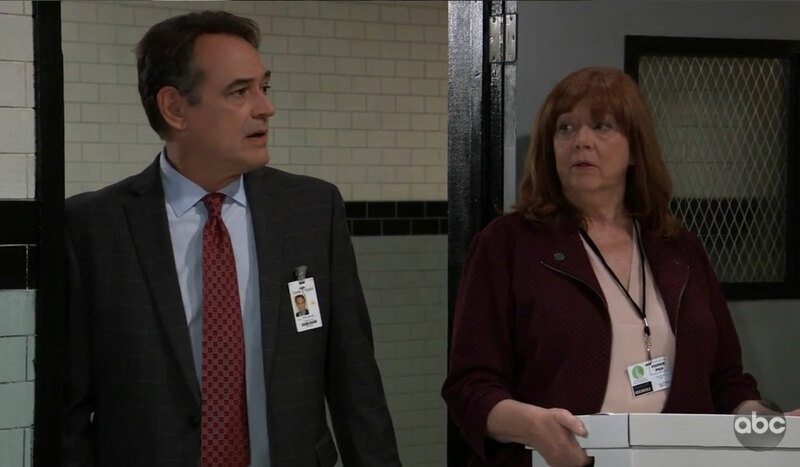 They move on to Carly’s cell, where they have another run-in with Mary Pat, who is still lingering around and packing her belongings. Mary Pat blames Carly for being fired, but also for her credit cards being canceled, and her rent being jacked up. Carly reminds Mary Pat that she warned her who she was, but Mary Pat wouldn’t listen and was on a power trip and now she is paying for it. Ryan suddenly appears and is shocked Mary Pat is still there. She assures him she’s leaving and says goodbye to Caroline. Ryan scolds Laura for coming to this dangerous place and taking risks with these patients. He hugs her and says if anything happened to her that he’d never forgive himself. He reminds them this is the maximum-security wing. Carly brings up her neighbor who doesn’t seem to even be there right now. “Kevin” calls the nurse over, has their visiting privileges revoked and wants them shown out. He has to go and tells Laura they will discuss this further later. Before they leave, Carly demands the nurse on duty open the door and let her see her neighbor. Laura tells Carly that Kevin is right and they shouldn’t do this but promises they will make things right for these patients. Once they depart, Kevin is able to stand and look out the window. He calls to Laura, but she’s gone. Anna and Finn stop at Pentonville where Britt is brought into a room to meet them. Anna asks Britt when she last spoke to her mother. She hasn’t heard from Obrecht since Nathan’s death. She learns her mom held Peter hostage, which is why Anna is there. Anna offers Britt a deal out of Pentonville if she helps the WSB capture and arrest her mother. Back at the Floating Rib, Curtis and Jordan run into Stella. They both hope she will change her mind and attend their wedding, but she refuses. She no longer believes Jordan is going to hurt Curtis, and that Jordan is remorseful for what happened to Thomas, but there is still so much pain for her involved to celebrate and be happy for them. They offer to keep a chair open for her should she change her mind. Meanwhile, Michael can’t believe how low the DA is willing to sink. He reminds her that he is the CEO of ELQ and has powerful friends. Michael promises to do everything to protect his family, legitimately and legally. He suggests she not cross any more lines and abuse her power more than she already has, or he’ll have her investigated. Later, Mary Pat enjoys a martini at the bar and is joined by Ryan. 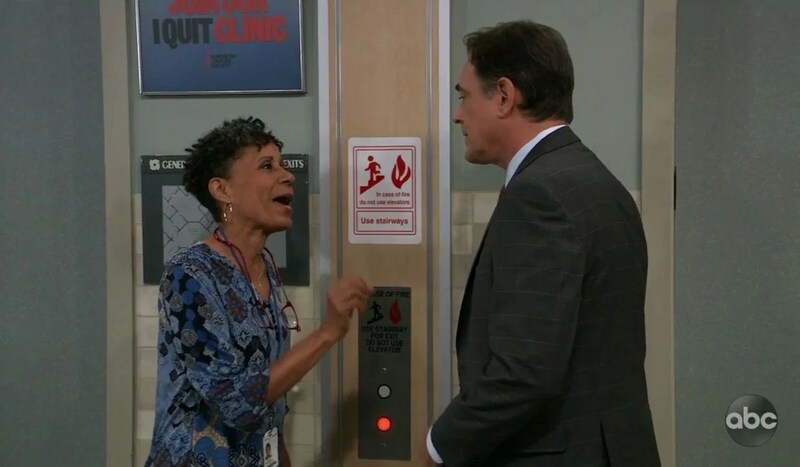 Sonny stops by Sam’s and learns that Margaux’s mom suggested the hit on her husband, which Jason thinks is the key to getting the DA to back off. Sonny has to decide how to use this leverage. Britt wants a better offer from Anna. In her car, Dawson calls Chase a freak and yells at him to get away from her car. Out with Peter, Lulu can’t believe what she sees. Jason thinks if Margaux chooses to cover up for her mom then they can nail her. Laura promises Carly that they will fix the issues at Ferncliff. Mary Pat tells “Kevin” she knew they hadn’t seen the last of one another.